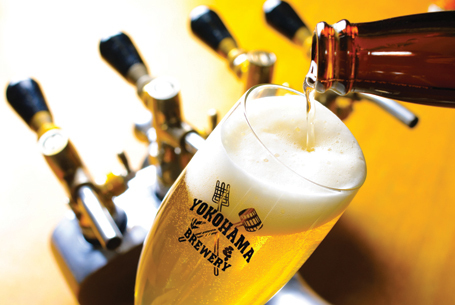 Yokohama Brewery is the oldest craft brewery and brewpub in Yokohama. 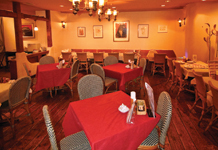 The brewery was established in 1995 and has won numerous awards for its beers at competitions across Japan since. At a recent competition of hundreds of local Yokohama products, their beer won the Mayor’s Award for achieving one of the highest scores from the Yokohama Goods 001 committee. Awards aside, their beer is simply good and appreciated by beer lovers all over Japan. Current head brewer Gojo became head brewer in late 2010, after previously acting as assistant brewer to Suzuki Shinya, who left to found Bay Brewing. Gojo continued to brew many of the Czech-inspired styles (like pilsner) that he learned from Suzuki, but also took the brewery in a new direction with Belgian-inspired beers. These beers use Belgian yeast, which imparts a slightly sweeter flavor than your average lagers from the mainstream breweries. Belgian beers also typically use wheat, which gives the beer a creamier body. Gojo’s “White Joker” is an excellent example of this beer. All of Yokohama’s regular beers, including their popular weizen (a German-style wheat beer), as well as seasonal beers are available at Umaya, the restaurant located just above the brewery. Umaya serves a wide array of both Asian and Western food that pairs great with beer. If you just want the beer, there is a small bar area downstairs, just outside the brewery area. Maybe you’ll see Gojo and his assistants Hamada and Fukata at work!